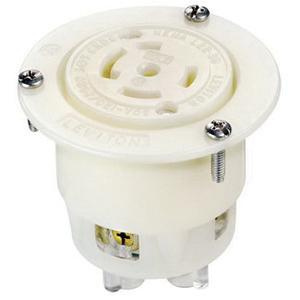 Leviton 5-Wire, 4-Pole, 3-Phase industrial grade flanged outlet locking receptacle in white color, is industry's leading locking device, which offers superior performance and long lasting reliability. It has voltage rating of 277/480-Volts, current rating of 30-Amps and power rating of 10 hp. Receptacle is UL listed, CSA/ANSI certified and NEMA rated.